The moment of joy and freedom came first for Cardinal Joseph W. Tobin of Newark, N.J. It was followed shortly by a moment that surprised him—and almost left him in tears. 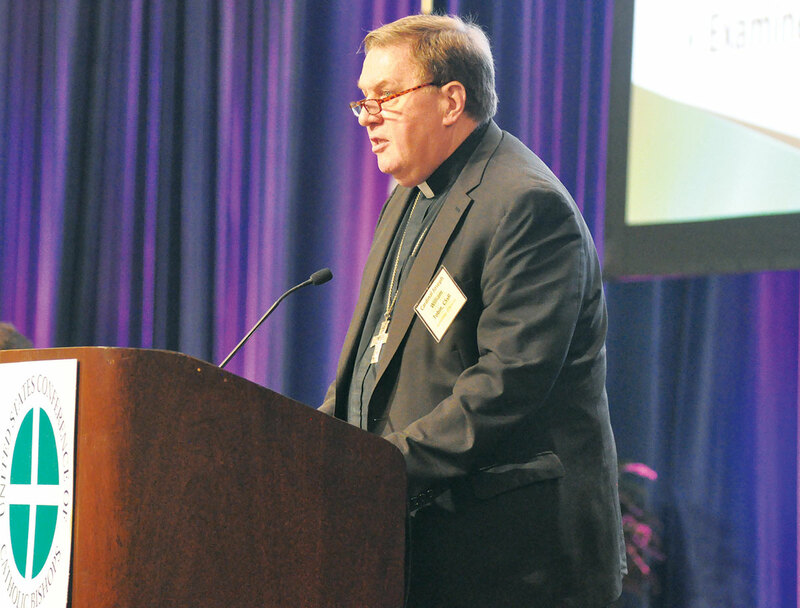 Both experiences occurred as the former archbishop of Indianapolis returned to Indiana’s capital for the spring general assembly of the U.S. bishops in mid-June. The Detroit-born Cardinal Tobin often enjoyed the pleasure of driving when he led the Archdiocese of Indianapolis for four years—a pleasure that has been severely limited since he became the archbishop of Newark in January. There, he has a driver to handle the congested traffic of that northern New Jersey city. So returning to Indianapolis for the bishops’ conference gave him the joy and freedom of getting behind the wheel again. “I was allowed to use my old car here, which I was grateful and delighted to be able to do,” he said. That feeling led to an emotional moment after he parked the vehicle at the JW Marriott hotel in downtown Indianapolis where the conference was held. Cardinal Tobin shared those moments—and his thoughts on his life since becoming a cardinal and leaving the Archdiocese of Indianapolis—in a conversation with The Criterion. Q. When you were named a cardinal in October, you said, “Perhaps the news was an indication that God thinks I don’t love the Church enough. So he’s given me an even more profound way to love it more.” Talk about how you have tried to live out that challenge since then. A. “The first thing was not simply to go slogging my way to Newark. But to say, ‘This is what God wants from me.’ I recall a conversation last summer I had with [Pope] Francis. Twice he said to me, ‘I don’t know why I’m here. The short version is that the Italians couldn’t agree on a candidate. But because this wasn’t my project, I accepted it as God’s will, and I’ll have what I need.’ He said that twice during this hour. And later on, I wondered if that was a little teaching moment he was preparing me for. Q. What are some of the differences you’ve experienced between the two archdioceses? A. “There are some real challenges that I didn’t have to face here. One is the concentration of people. I’m only responsible for four counties instead of 39 counties here. But there are 1.6 million Catholics there, and we celebrate the Eucharist on Sunday in 23 languages. So those are the differences. Q. What have you found to be your additional duties as cardinal? Q. You mentioned being available. One of your most defining moments in the Archdiocese of Newark so far was when you stood by a Mexican immigrant—a 59-year-old grandfather—who was threatened with deportation. Your actions were in line with welcoming a Syrian refugee family to the Archdiocese of Indianapolis. Talk about the Church’s continuing commitment to refugees and immigrants at this point in American society, and your commitment to making it a priority in your ministry. A. “Let me give you my favorite Francis story right now. I have this from two pretty good sources. Shortly after his election in 2013, he called up the [Vatican] secretary of state at the time—Cardinal [Tarcisio] Bertone—and said, ‘I want to go to Lampedusa,’ the island in the Mediterranean that’s part of the Italian territory, but it’s actually closer to North Africa. Q. During the USCCB meeting in Indianapolis, you and Archbishop Charles J. Chaput of Philadelphia will lead a discussion on the 2018 Synod of Bishops with its focus on young people, faith and vocational discernment. Talk about the importance of the synod, and what you hope to accomplish during the meeting of the bishops. Q. What do you think the Church needs to do to reach young people? A. 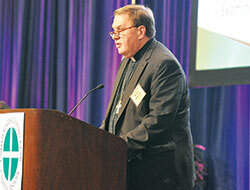 “The first thing the Church can do is be with young people. Pope Francis uses the word ‘accompaniment.’ It’s sharing the road with young people, and having something to share with them. Q. Here’s a question that many people in the archdiocese want to know: How is your mom doing?